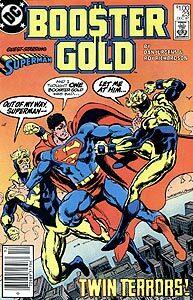 Cover Description: Above the Metropolis skyline, Superman separates two identical Booster Golds. Brief Synopsis: Booster Gold battles a duplicate in order to protect Superman from the machinations of Lex Luthor. Issue Notes: This is the first Booster Gold issue to cost more than it's original 75¢ cover price. The title will be canceled after just 2 more issues. Gus, Lois' cameraman, asks Lois which is the "real McCoy?" This common idiom, indicating the original thing and not a copy, has been the object of much speculation, and its origins remain unknown. After lying about the events of the past issue, the Booster who disabled Superman launches an attack on the newly arrived Booster, leading directly to a fight between the two Booster Golds. This is the sort of thing that can only happen in comic books. Superman uses his X-Ray Vision to confirm which Booster is the true Booster. Superman would be very useful in airports. After watching a tape of the fake Booster's press conference, Booster admits that he agrees with the imposter about Superman's actions in Qurac, though he would never say so in public. Revealing that androids are commonplace in the 25th century, Booster proceeds to pull the arms off his imposter, an android duplicate of Booster Gold, before burning his "flesh" off with a full power Booster Shot. Collecting the small piece of Kryptonite released by the defeated android, Booster comments that he could make a "great ring" out of it. This comment is a reference to the Kryptonite ring worn by Lex Luthor, which debuted in Superman, Vol. 2 #2, cover dated February 1987. The radioactive properties of Kryptonite over long exposure to Luthor's skin would eventually lead to a malignant cancer that would force Luthor to transfer his brain into a cloned body. Booster taunts Superman with the small piece of Kryptonite, suggesting that he may keep it himself. In the post-Crisis on Infinite Earths DC Universe, Kryptonite became a very rare element, with its only pieces in the possession of Lex Luthor. The creator of the android Booster is revealed to be none other than Superman's arch-nemesis, Lex Luthor. Luthor's plan was to use the android to simultaneously destroy both Superman and Booster, whose B.G.I. has become a dangerous corporate opponent. Luthor receives news that LexCorp outbid B.G.I. for acquisition of a company called Silver Optics. This continues a string of recent business competition between Lexcorp and B.G.I. Luthor does not appear concerned that LexCorp had to pay "an enormous amount of money" to win the deal. FIRST APPEARANCE: First appearance of Attack Dog One, a villain empowered by Lex Luthor as a backup to his plan with the android. He shoots compressed air from his palm and uses an energy staff. Superman unmasks Attack Dog One to reveal him as Will Roberts, apparently an employee of the Electronics Group of Booster Gold International. Even Attack Dog One's costume is made up of parts stamped "B.G.I." Booster complains about the obvious frame-up. The Luthor Yacht is really a minor cruise ship created to Luthor's specifications. Though it is difficult to judge scale, the boat is probably longer than 250-ft long, making it among the largest private yachts in the world. From the dialogue balloons, guests aboard the Luthor Yacht would appear to include Bruce Willis (an actor who at the time was known primarily in the role of David Addison on the popular television show Moonlighting), Paul McCartney (one of the three surviving members of the British pop-quartet The Beatles), Warren Beatty and Dustin Hoffman (stars of the 1987 box office debacle Ishtar, commonly considered among the worst and most expensive movies ever made). Also mentioned is an acquaintance of Commander Bond (the rank and last name of British super-spy James Bond, whose exploits were detailed in the 1987 movie The Living Daylights). Bruce Wayne is pictured among the partygoers. After crashing Luthor's party, revealing that he shill bid the value of Silver Optics up to force LexCorp to pay double the company's value, and stealing Luthor's date with some choice words, Booster reveals that he knows that Luthor was behind the smear campaign on his name. This seems to make Luthor very angry. This is Booster's first face-to-face meeting with Lex Luthor. Boosterrific Review: This story begins where Action Comics #594 left off, and really does not make much sense without it. Worse, the art team of Dan Jurgens and Roy Richardson, while certainly passable, are not as dynamic a duo as Action Comics' John Byrne and Keith Williams. Despite these facts, this issue is otherwise superb. Who could ask for anything more than Booster Gold and Superman together against a robotic Booster Gold and Lex Luthor? If nothing else, this issue is a must read for the scene of Booster taunting Superman with Kryptonite. Excellent. Great issue and, as our host notes, Booster taunting Superman with Kryptonite is worth the prices of admission alone.